Simple & Effective Managed IT Services Perth - Why choose Netlink? Netlink Group have been providing high quality IT solutions, consulting and managed IT services to Perth businesses since 1994. We are pioneers of the Managed Services Providers, one of the very first in WA... we’ve been doing this for 17 years! Our highly accredited and award-winning team uses enthusiasm, technical excellence and the highest level of service to meet and exceed your strategic business objectives. Without the jargon. We provide you with the proactive strategic IT services and support required for business continuity and growth whether you are an entrepreneurial SME or an enterprise-level industry leader. Delivering legendary service – Simple! Providing consistent customer satisfaction – Managed! Offering strategically successful solutions – Effective! And we are Passionate (caring deeply about our work) Committed (to professionalism, excellence and innovation) and Collaborative (working with you to achieve your objectives). We can provide you with comprehensive IT support and telecommunications services anywhere in Australia. Also we are an award-winning company and have gained numerous accolades for the quality of our service including Telstra Gold Business Partner accreditation, Cisco Premier partnership and many other global vendors technology partnerships. Get proactive, not reactive, IT services. Netlink Group prides itself on being very technically smart whilst still being the nicest people to deal with. Whilst most of our people are technical, we have a strong management team that focuses on excellence in everything we do. 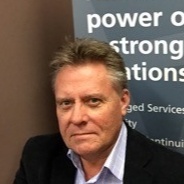 Steve van Blommestein is the Managing Director and founder of Netlink Group. Steve spends most of his time working on the business, growing strategic vendor relationships, making sure we stay relevant and grooming the right people and culture that is omnipotent for a company providing legendary services. William Aves joined Steve in 2000 from a background in the travel industry and has been with the company ever since, growing through the ranks, becoming a shareholder in 2007 to his current role as the Professional Services Manager. Will runs one of the most critical departments in the business that underpins the success of large projects and professional consultancy. James Rodoreda joined us in 1998. James in known amongst the troops as a Legend! He is a legend in his technical expertise and he is famous of giving legendary service. With that amazing combination, this shareholder commands the Technical Services manager role making sure that Netlink Groups stays technically proficient in everything we do and everything we support. Pedro DeCarvalho has been our General Manager for the last 6 years. Pedro joined the team initially to lead a large service team and over the years has proven himself as a solid and reliable manager of Netlink Groups’ largest group, the techs who join forces to give our customers legendary service. Pedro has a long pedigree of ITIL based Managed Services provision and grooming eager new technical staff to become hugely important people in the Netlink Group technical fabric. Brett O’Donnell joined Netlink just after the crazy Dot Com days and has probably held the most amount of roles of any long-term employee at Netlink Group. As a junior tech he was much revered by customers so we gave him the opportunity to grow our service desk to what it is today. Brett is deemed our Chief Information Officer because he probably knows everything you need to do to completely service a customer, with the best possible outcome. Brett is also a shareholder of Netlink Group. David Gapes got his break in IT with Netlink Group joining us as a Service Desk Coordinator in 2011. Dave helped grow the service desk on its journey to become recognised as one of the best in WA. Moving on he took on senior account management roles for which he managed most of our enterprise clients. Dave left Netlink in late 2014 seeking new opportunities but fortunately we wooed him back and now he is our Senior BDM, building amazing solutions for our lucky new clients taking up Netlink Group’s legendary services. Cut your IT costs by more than 30%. Increase your IT capability. Netlink will keep your IT systems secure, stable and fully supported, at a fraction of the cost of doing it yourself. Our mantra is to make it simple, manage it completely, and ensure it is effective.